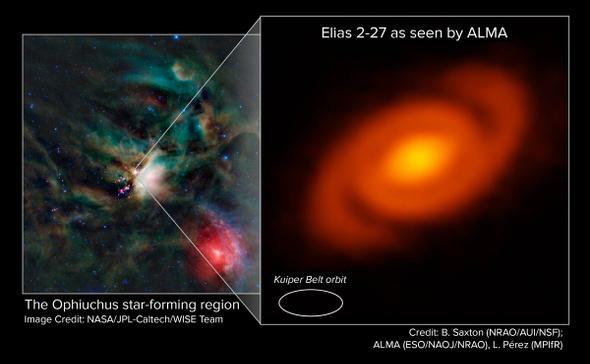 Elias 2-27 is a newborn star with a big spiral. That’s no galaxy! It’s just one star, one planet … and a spiraling density wave of dust. About 450 light-years from the Sun, in the constellation of Ophiuchus (yes, that Ophiuchus), lies a young star. If it were off by itself somewhere it would be an unremarkable star, a red dwarf roughly half the mass of the Sun. The galaxy is lousy with them. But it’s not by itself. It’s sitting in a vast dense cloud of gas and dust sometimes called the Ophiuchus star-forming region. Stars are being born in this huge nebula, and Elias 2-27, as the star is called, is one of them. Stars form as pieces of the cloud collapse under their own gravity (generally instigated by some sort of event that disturbs the cloud like a nearby supernova or a collision with another cloud). A clump of material shrinks, and flattens into a disk (I describe this in Crash Course Astronomy: Intro to the Solar System; start at time 5:36). The star forms in the center, and out from the center clumps of material form, stick together, grow, and become planets. Sometimes the gravity of a planet can attract enough material from around it that it carves a gap in the disk, similar to the gaps in Saturn’s rings. Theoretically, a planet forming can cause spiral patterns in the disk, like the spiral arms of a galaxy. One has never been directly seen in a protoplanetary disk, but there have been hints. That’s changed now. 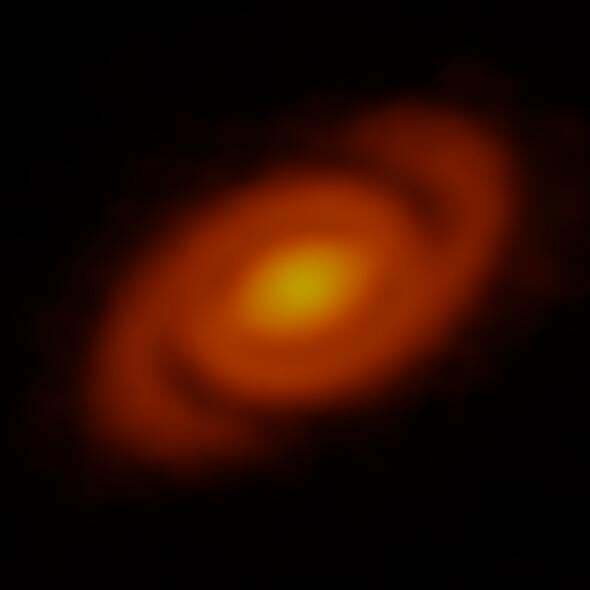 Using the Atacama Large Millimeter/submillimeter Array, or ALMA, which observes light with much longer wavelengths than our human eyes can see, just such a spiral has finally been detected directly. Elias 2-27 has a beauty, too. Just a little context for you. The Ophiuchus region is pretty amazing. Click to embiggen. The star itself is buried by dust in the center, too enshrouded to be seen (actually, the dust in the Ophiuchus cloud blocks all the visible light coming from the star and the disk; the submillimeter wavelength light can penetrate that junk and be picked up by ALMA). Just outside that is a classical flat disk, seen as the yellowish ellipse in the center (it’s probably close to circular in real shape, but we see it at an angle). Outside that is a dark gap, which is exactly what you’d expect from a forming planet. The planet itself isn’t visible. The spiral starts just outside the gap, and the arms extend to about 10 billion kilometers from the star (Neptune orbits the Sun about five billion kilometers out, for reference). This sort of structure is called a density wave pattern; it’s not really a physical structure, it’s regions where the gravity of the disk sets up conditions that particles are denser there. So the spiral arms don’t wind up! It’s more like a traffic jam. Cars can enter the jam from behind, stay it a while, then move out the front. The jam persists, even as the individual cars move in and out of it; I describe this as well in Crash Course Astronomy: The Milky Way (start at 4:58). This is just what you’d expect from a planet in that gap; the gravity disturbs the disk, and the density wave pattern arises naturally from there. Given that the arms start there, I’d bet cold cash there really is a planet or other massive object in or very near that gap. While this structure has been expected to exist in these star- and planet-forming disks, none has ever been seen before, and this shot is so clear! It’s wonderful. ALMA has been a powerful tool for astronomers, peering deep inside clouds, at galaxies, at material surrounding black holes, at objects in the distant solar system, at dying stars (yeah, click that; the image is amazing), and at quite a few forming stars. The equipment available to astronomers today is nothing short of stunning. We are looking farther and better into the Universe than we ever have before, and what we’re finding is remarkable. Understand: When we look at objects like Elias 2-27, we’re seeing what the Sun may have looked like 4.6 billion years ago! It’s easy to think of astronomy as looking outward, away from ourselves. But it’s the opposite; the more we look out, the more we see in.